Welcome to 2011! The start of a new year is a time when we’re all very conscious of keeping new resolutions as strictly as we possibly can. I saw somebody tweet the other day, “what is it about a new year that makes us actually want to do housework?”. I thought – how true! There is something about the freshness of having a new year that makes me want to don my apron, rubber gloves and blitz the house with all manner of cleaning products until it’s sparkling clean. I feel energised to make an effort as part of a “fresh start”. In light of the cleaning frenzy initiating in homes all over the country, I have collected a few top products and top tips for cleaning in the new year. Ecover, Natural & Clean and some Earth Friendly products are all on offer in our Winter Sale, making an early Spring clean even easier! Natural & Clean have a fantastic range of organic, bio-degradable and natural cleaning products, set to bring new life into carpets. For a quick and easy solution, take a look at the Natural & Clean Carpet & Fabric deodoriser, which removes malodours with a single spray. For deeper cleaning, the dry carpet cleaner, able to absorb dirt through thousands of tiny granules, and the foaming carpet cleaner are on offer at the moment, so bag yourself a bargain whilst you can! Grime can easily build up around your bath, particularly if you live in a hard water area. Our customers recommend a number of products to tackle this problem. 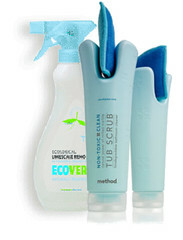 Some of our customers rave about the longevity of Method’s Tub Scrub’s gently abrasive formulation and other customers are happily convinced that Ecover’s Limescale Remover is the best on the eco-market. Ecover washing-up liquids and dishwasher tablets are on offer at the moment, so now is the time either test these popular eco-friendly dish-washing alternatives, or to stock up if you are already a fan! The cloths you use to clean are as responsible for the result as the cleaning products themselves. E-cloth have a fantastic range of products made with millions of clever fibres which attract dust, leaving your home even more sparkling than it was before. The screen cleaning pack from E-cloth has proved itself indespensible in our office here. Even the most eco-friendly and carefully formulated products can sometimes irritate our hands, especially if cleaning for some time. 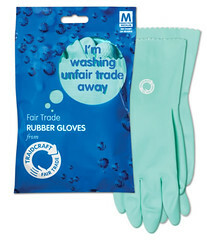 Grab yourself a pair of fair Trade rubber gloves and protect your precious fingers. Try using some soothing hand lotion afterwards, Neal’s Yard Hand Softener is a firm favourite here, as is Herbfarmacy’s Skin Rescue Balm, made with marshmallows! After all, you deserve a little luxury after a cleaning spree.